Article III.—The Children of Senchan. In the Martyrology of Donegal, a festival intended to honour the children of Senchan is set down, at the 23rd of June. Among the saints of Scotland, we find enumerated the fourteen sons of Senchan or Clann Senchan, for this same date. Article IV.—The Children of Senan. We read in the Martyrology of Donegal, that the children of Senan were venerated, at the 23rd of June. We think, however, that this is only another form for a previous entry. The same double entry for 'Senchán's children and Senán's' is found in the Martyrology of Gorman, but their names are not found at all in the earlier martyrologies of Oengus and Tallaght. SENCHANIUS, the Fourteen Sons of June 23.—These are probably the Clann Senchain who are commemorated in the Mart. Donegal at 23d June. A curious " Description of the Island of Sanda," by Father Edmund MacCana, makes mention of the sepulchre of the fourteen sons of Senchanius in that island. It is printed with observations by Dr. Reeves in the Proc. Roy. Irish Acad., vol. viii. p. 132. Senchanii natum Sanda beata tenet. 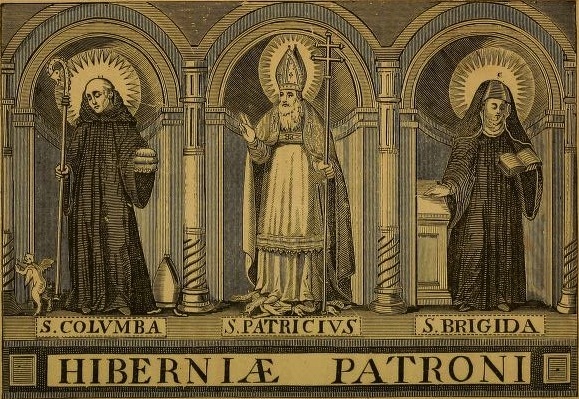 Doctorum divumque parens, Hibernia quondam . Of Senchanius born blessed Sanda holds. Reputed Feast of St. Senilis. According to Dempster,  the early teacher of St. Columban in Scotia had a feast, at the 21st of June. He is called Senilis, by that writer,  whereas, the true name was Silenis or Sillen. The Bollandists  who note this reputed festival, at this day, have nothing more to state about him, and they postpone further mention of him to the 21st of November, the feast of his renowned disciple St. Columban. In his "Menologium Scotorum." In Dempster's "Historia Ecclesiastica Gentis Scotorum," there is no notice taken of him. Thus : "In Scotia, Senilis S. Columbani praeceptoris." See Bishop Forbes' " Kalendars of Scottish Saints," p. 203. See "Acta Sanctorum," tomus iv., Junii xxi. Among the pretermitted feasts, p. 66. At the 20th of June, we find the name Cassan, of Cluain-ratha, entered in the Martyrology of Donegal. The Martyrology of Tallagh gives this commemoration, at the previous day. At this date, we find introduced into a Calendar the festival of a beatified woman, whose name is not known, but whose soul St. Columkille beheld ascending into Heaven. After a great struggle with demons, the Angels came to receive her into the mansions of everlasting bliss. This festival is noted by the Bollandists, among the pretermitted saints. Richard Sharpe, ed. and trans., Life of Saint Columba, (Penguin Classics, 1991), 213.